If you’ve read my reviews before, you’ll know I hate writing negative reviews. It makes me feel bad, because I know the work that goes into writing a novel, but as a reviewer, I also know that I need to be honest. From the moment I saw this book, I was so sure I would enjoy it. The synopsis doesn’t give us much to go on, but I loved the cover, and thought it would be a quick, fun summer read. Even when I started seeing all the negative reviews for it, I was still certain I would like it. Within the first few pages, I knew I was wrong. There were so many times I wanted to stop reading, but I was just curious enough to see where the story would lead, and if it would get any better. Unfortunately, the story didn’t lead anywhere, and I’m actually pretty irritated that there’s a sequel because nothing really happened in the first book, so it would seem to make more sense for everything to have happened in one book and for that one book to actually have an interesting plot. Since the synopsis doesn’t actually tell you anything, here’s the gist: Violet, who lives in London, is in a museum one day and comes face-to-face with a painting from several hundred years ago where the subject is her exact replica. Not much is known about the painting or the artist, but she finds out it was painted in Italy, and long story short, finds a summer course in Italy and convinces her mum to send her so she can figure out the mystery. Violet drove me absolutely crazy. Her internal dialogue was annoying and often pointless, she made all these random observations about everyone and everything that led to the book being overly descriptive and often boring, and she was completely obsessed with Luca, even though she said - repeatedly - that she was never ‘that girl’ who got obsessed over boys and talked about them endlessly. I couldn’t relate to her at all, and I wasn’t able to connect with her on any level. The other characters weren’t much better. Kelly, Paige, and Kendra, the other three students, all fell flat for me. They had no depth, and Violet’s ever-changing feelings toward them got on my nerves. At first she didn’t like Paige and Kendra - the Americans - but then she realized they weren’t so bad, but then she made all these little observations about them, or talked about them in a way that made me dislike them even more. I particularly disliked Paige - her over-enthusiasm and brainlessness made me cringe repeatedly. And I hated the competitiveness - first between the Italian host’s daughter and all the girls, then between Kelly and Kendra, the two ‘brains’ of the group. It was all so catty and childish. Then there was Luca, the ‘love interest’. 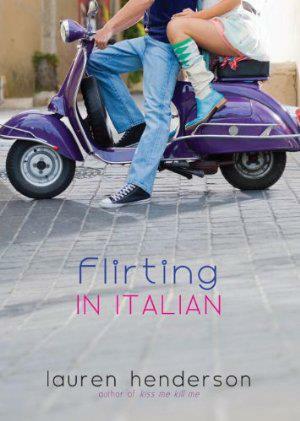 This had so much potential - a hot Italian boy, summer romance in a beautiful, foreign country - should be totally swoonworthy right? Except the hot Italian boy was a complete jerk - arrogant, bitter, cynical, and condescending. He insulted Violet on numerous occasions - basically told her she was common so that’s why the Italian boys ignored her, said kissing meant nothing, speculated that they might be somehow related, and yet Violet still found him irresistible and wanted to make out with him every chance she got. Violet would get mad at Luca for judging her and the girls and being superficial, but she was the exact same way. Everything was about appearances for her, and she spent at least half the novel making observations about how everyone looked, and comparing all the other girls to herself or to girls in London. The story finally started to pick up near the end, although the added ‘mystery’ seemed kind of random. Violet went to Italy for a specific reason and she barely even pursued that reason. I’ll admit the added mystery kept me guessing, and the way the book ended had me wondering, but it didn’t make up for the rest of the book where basically nothing happened. Even when I don’t like a book, I always try to say something positive so it doesn’t turn into a rant (maybe a tad late for that this time!). I enjoyed the setting - I think it would be really cool to spend a summer in Italy doing casual studying and having free time to enjoy the sights and nightlife. The mystery was intriguing and was part of what kept me reading. Even though I didn’t like the characters, each of them had their likeable moments, where they would do or say something that somewhat redeemed them, even temporarily. Overall, this book really wasn’t for me. I enjoy light reads - even occasionally something a bit mindless to just relax and enjoy without thinking too much - but this book fell short in all areas. A weak plotline, unlikable characters, and almost a complete lack or anything actually happening through the entire story left me disappointed. As always, this is just my opinion - I’m sure there were plenty of people who thoroughly enjoyed this book, and you may be one of them if you give it a shot. Have you read this book? I'm really curious to see what other people thought of it, because the majority of the reviews I've read have been negative. What do you think of stories set in beautiful, foreign countries? For me, they definitely stir up my wanderlust! I've seen this book around, wondered about it ... but have so much to read these days ... That nothing happens can be such an anticlimax, esp. considering the potential of the storyline. Sorry you didn't enjoy this book that much. Sorry this one didn't work for you. I haven't picked it up yet and based on what I'm seeing (for instance, you *and* Giselle both didn't like it) I'm probably going to wait on it. There are tons of other things I could be reading.